Phillippa Benning is the unrivaled beauty of the Season. But when another lady challenges her for a marquis's attentions, Phillippa entices him to a secret rendezvous-only to stumble upon The Blue Raven, England's most famous spy, lurking at the site of her planned tryst. The Blue Raven has uncovered an enemy plot directed at upcoming society functions, but he's unable to infiltrate London society. Phillippa makes an offer: in exchange for entrée among the ton, he agrees to have his true identity revealed at the Benning Ball-guaranteeing her unrivaled notoriety. As the danger draws closer, the mysterious spy and Phillippa give in to mutual desire. But when the game turns deadly, betrayal waits around the corner, and Phillippa must decide once and for all-is it the myth that captured her heart, or the man? 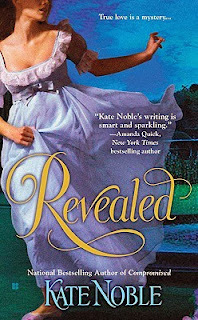 I discovered this book through Blodeuedd of Book Girl of Mur Y Castell because she recommended Kate Noble to me back when I was looking for more historical romance authors to read. :) I am not normally one for spy stories, but this one just seemed cute-and it was. I really enjoyed this book. I loved Marcus, and I loved Phillippa changing from a society snob to someone who cares. She was so hard to like in the beginning, but quickly grew on me and I found myself cheering for her and Marcus to get together. I loved that she helped him figure everything out, shocking him along the way that she wasn't as cold or flighty as she acted with the rest of the ton and that there was something more to her personality. The secondary characters were wonderful as well. I loved haughty Broughton who Phillippa was trying to win his affections, and Lady Jane was a great rival. Bryne, Marcus's brother, broke my heart, and I really can't wait to read his book. I also loved that there were a few twists and turns that surprised me-I should have seen them coming, but I totally overlooked some obvious clues. ;) I love it when that happens. "It's going to a fabulous affair, Nora, don't doubt it." Phillippa I said airly, as she paraded down bond Street in her new plum-colored walking costume, with lavender suede gloves and a silk bonnet. That wasn't so bad, but then towards the end of the book Phillippa calls Marcus a moron. in this sentence-"If you think that, you're a bigger moron than I took you for." Ok, so he was acting like a big old moron, but I was curious, and looked up moron to discover it wasn't used until 1910. I don't know why throwing in some modern words, but not others bothers me so much in historical romances, but it does.